1/4″ (6mm) ID x 25' (7.6 m) long rubber waterblast hose. 1/4″NPT ends. Working pressure up to 10,000 psi (700 bar). 3/4″ (19mm) ID x 50' (15.2 m) long rubber waterblast hose. 3/4″NPT ends. Working pressure up to 10,000 psi (700 bar). 3/8″ (10mm) ID x 50' (15.2 m) long rubber waterblast hose. 3/8″NPT ends. Working pressure up to 10,000 psi (700 bar). 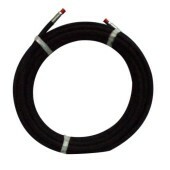 3/8″ (10mm) ID x 66' (20.1 m) long rubber waterblast hose. 3/8″NPT ends. Working pressure up to 10,000 psi (700 bar). 3/8″ (10mm) ID x 66' (20.1 m) long rubber waterblast hose. 3/8″NPT ends. Working pressure up to 15,000 psi (1000 bar). 1″ (25mm) ID x 25' (7.6 m) long rubber waterblast hose. 1″NPT ends. Working pressure up to 10,000 psi (700 bar). 1″ (25mm) ID x 35' (10.7 m) long rubber waterblast hose. 1″NPT ends. Working pressure up to 10,000 psi (700 bar). 1″ (25mm) ID x 50' (15.2 m) long rubber waterblast hose. 1″NPT ends. Working pressure up to 10,000 psi (700 bar). 1″ (25mm) ID x 66' (20.1 m) long rubber waterblast hose. 1″NPT ends. Working pressure up to 10,000 psi (700 bar). 1/2″ (13mm) ID x 25' (7.6 m) long rubber waterblast hose. 1/2″NPT ends. Working pressure up to 10,000 psi (700 bar). 1/2″ (13mm) ID x 35' (10.7 m) long rubber waterblast hose. 1/2″NPT ends. Working pressure up to 10,000 psi (700 bar). 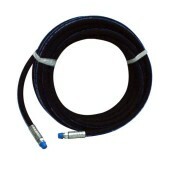 1/2″ (13mm) ID x 50' (15.2 m) long rubber waterblast hose. 1/2″NPT ends. Working pressure up to 10,000 psi (700 bar).